A giant of fantasy art as towering as the heroes, heroines, and monsters he famously painted, Frank Frazetta has died at the age of 82. As reported by The Beat, the artist—best known for his rich, vivid portrayals of mythic beasts and warriors like Conan and Tarzan—succumbed to a stroke today. 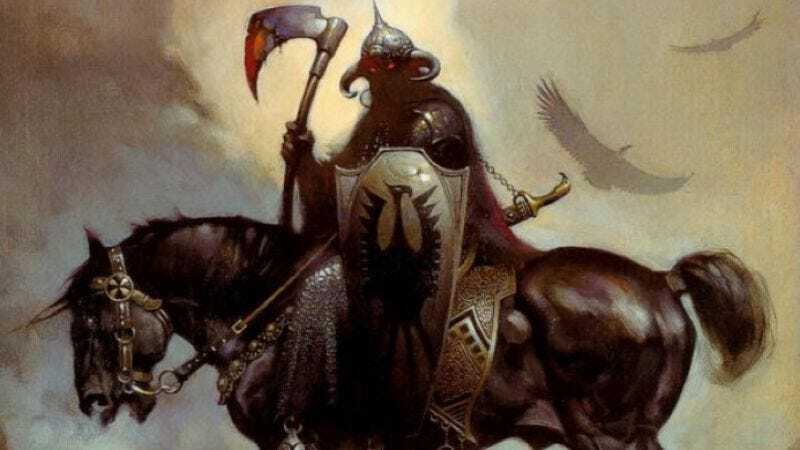 Frazetta had recently suffered from a thyroid condition, dementia, and a series of strokes, plus a public struggle within his family for the rights to his work. In addition to the iconic imagery he produced for book covers, magazines, posters, calendars, comics like Harvey Kurtzman's Little Annie Fanny, and animated films like Ralph Bakshi's Fire And Ice, Frazetta was also known for his rock album cover art, most notably those he did for Dust, Nazareth, Wolfmother, and Molly Hatchet. Rest in peace, Mr. Frazetta. Actually, scratch that: May you gallop into glorious battle with an army of epic-chested Valkyries at your back for all eternity.